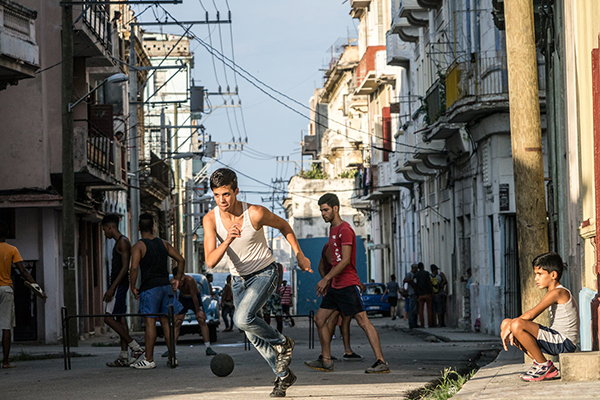 Come with us and experience the sights and sounds of Cuba’s captivating capital. On our Group Full Day Havana Tour we will show you the very heart of this unforgettable city, a place that has had a tempestuous history, evolving into a place so full of life while still being remarkably relaxed. Havana might feel like a city that has been shrouded in mystery at times, but our Group Full Day Havana Tour will allow you to unlock the mysteries of this magnificent destination. You will marvel at the disheveled style of the city’s colonial buildings while learning about Havana’s brilliantly contradictory history. You will travel along the Malecón in one of those classic convertible cars, witnessing the former beauty of the Miramar district and the hustle and bustle of Havana Vedado. Our Group Full Day Havana Tour starts at 9.30am, meeting at a location in the San Francisco de Asis Square, Old Havana. This tour will take approximately 7 hours. Walking tour, taxi and chauffeured Classic Convertible Car. Services of a private English speaking local Havana tour guide + Old Havana Walking Tour + Lunch with one drink included at a authentic Cuban Paladar + Chauffeured Convertible Classic American Car Tour + One drink at Hotel Nacional over-looking the Malecon in Havana Vedado. 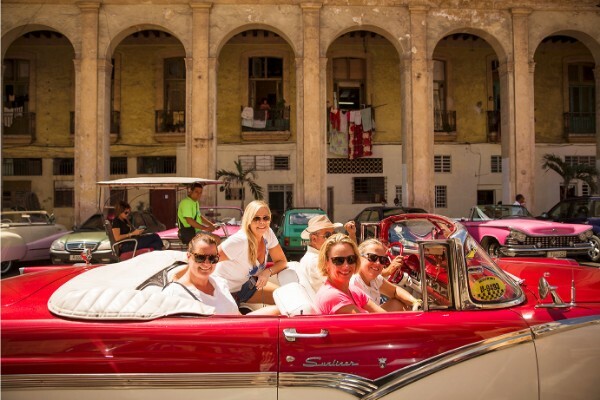 Our Group Full Day Havana Tour departs every day. A Private Full Day Havana Tour is also an option, depending on the time you would like to start. ⭐ Your experienced Havana tour guide will be with you at all times to answer any questions you might have. 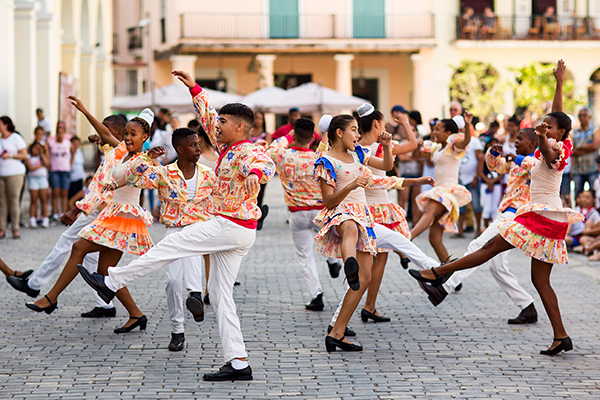 ⭐ The street theatre that is Old Havana is a key highlight of your Old Havana Walking tour. ⭐ Cuba’s unique revolutionary past is on full, proud display as you pass by the Museo de la Revolución and Floridita. ⭐ Be sure to snap plenty of photos of this bustling capital city..
⭐ There will be plenty of time to stop and admire the architecture and to take in all the beauty on display. 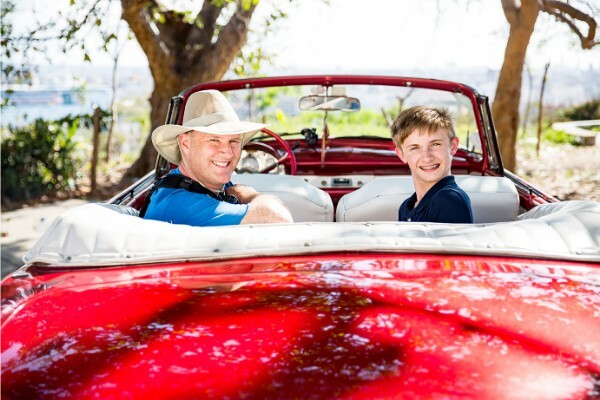 ⭐ No visit to Havana is complete without a cruise in a convertible classic car. ⭐ Experience the profound beauty of Havana’s famous Colon Cemetery as you drive past. ⭐ Enjoy the architectural variety of Miramar – once home to Havana’s elite. ⭐ Stop at the impressive Hotel Nacional for a mojito (or non alcoholic beverage) with views of the Malecon. 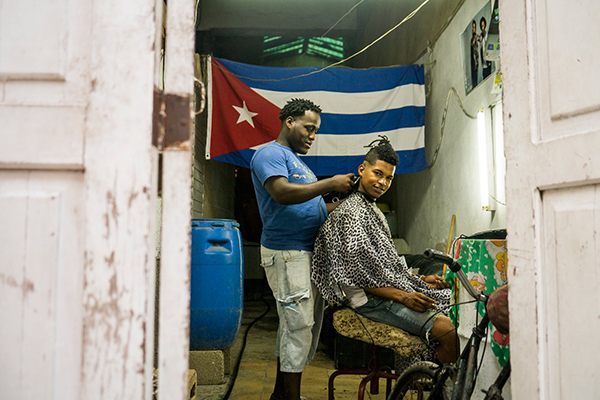 There’s no better way to see Havana than on foot (although we certainly don’t expect you to walk for the whole day – there is simply too much to see). Your guide for our Group Full Day Havana Tour will meet you at a location close to the Plaza de San Francisco Square in Old Havana. It is here you will begin an enjoyable walking tour of Havana’s Old Town. Old Havana is where the city was born. Once a fortified settlement, the city soon began to creep beyond the fortress-like walls of the old town to become the city you will quickly come to love. We know that you will be taken in by the delights on offer, such as El Capitolio, the Museo de la Revolución, and the Hotel Inglaterra to name but a few. 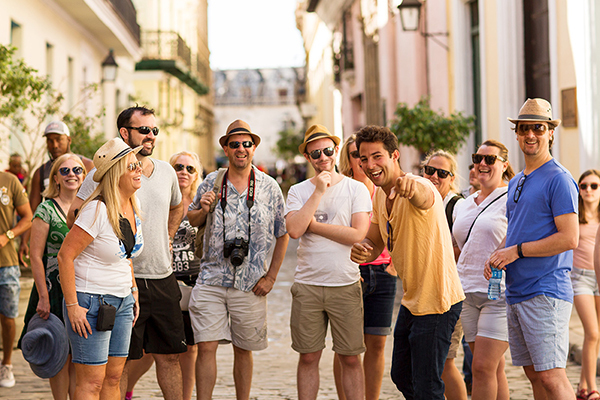 Your Old Havana Walking Tour takes in some of the most stunning squares you will ever see – the Plaza de Armas, Plaza de la Catedral, Plaza San Francisco de Asis and Plaza Vieja. While these sights will demand your attention, there is also the possibility that you will be just as enchanted by watching the people of the city as they go about their daily lives. 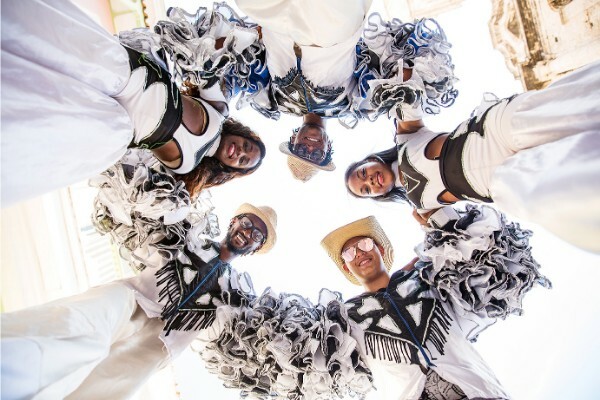 We like to think of Old Havana as being like a street theatre of sorts, and this is the side of the city we pride ourselves in demonstrating on our Group Full Day Havana Tour. 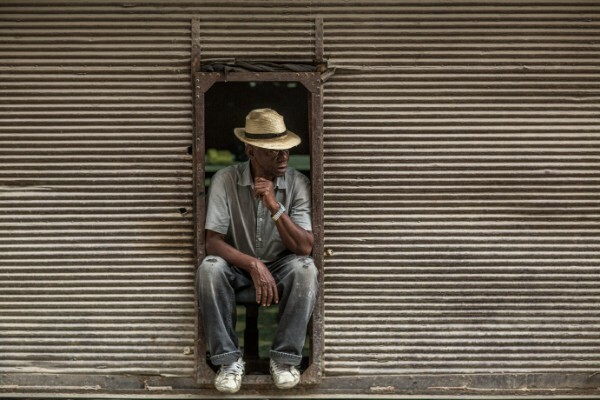 Your tour guide will be with you every step of the way, and yet Old Havana can be such a wonderfully overwhelming experience that you might need to wait until your relaxing lunch before you can ask any questions. Don’t hesitate to ask anything you might want to know more about. Or you might simply just appreciate some fantastic Cuban hospitality while you eat at a Cuban Paladar (an example of the burgeoning private restaurant scene in Cuba). It’s time to give your legs a rest as you slip into the lovingly-maintained seats of one of those convertible classic cars that prowl the streets of the city. 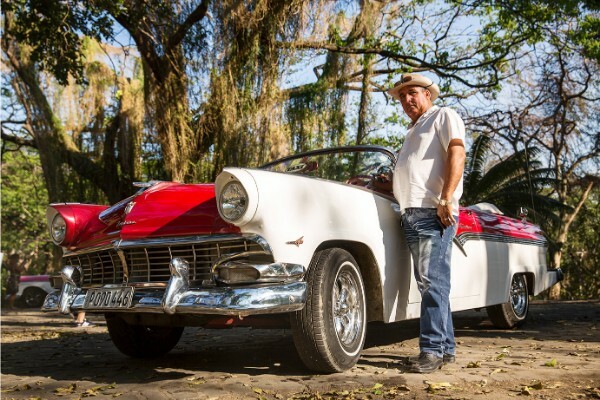 A classic car ride is a highlight of our Group Full Day Havana Tour, allowing you to cover far more ground in a nifty mode of transportation that has become part of the city’s very cultural identity. Leaving the glory of Old Havana, you will see the contrast as we drive through some of the newer parts of town, as well is taking in the crumbling mansions (and quite a few refurbished and repurposed ones) in Miramar. We will also take you past the Colon Cemetery, where those who influenced the city the most are laid to rest in remarkably ornate settings. You will also take in the suburb of Vedado and Havana’s famous Revolution Square. This is a tranquil respite from the rest of Havana, although you will of course be eager to rejoin the hustle and bustle. 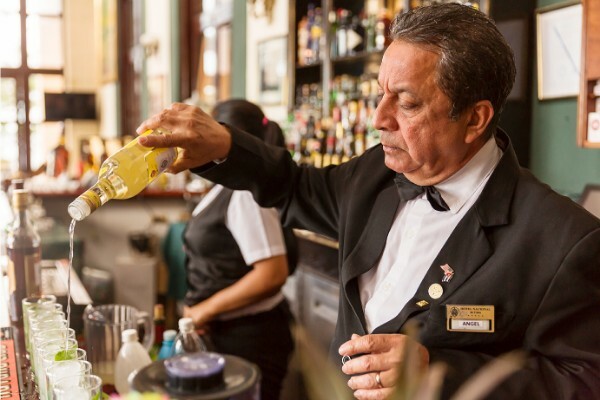 But before that, we need to take you to the last spot on your Group Full Day Havana Tour, which is a farewell drink with your guide while enjoying views of the Malecon at the historic Hotel Nacional. Your tour will conclude right back where it started at approximately 4:30pm, giving you the rest of the afternoon to savour all that you’ve seen.